DEVILSKIN Release Official Music Video For "Pray"
Popular New Zealand based hard rock band DEVILSKIN has released the Official Music Video for the second single off of their second studio album, "Pray". The video was directed by Tim Van Dammen on location in Hamilton, New Zealand, with the album recorded at Modern World Recording studio in the UK with Producer Clint Murphy (with whom they recorded their No 1, Platinum selling debut album We Rise). Be Like The River is available to stream on Spotify and Google Play, and download on iTunes. Check out the video on KNAC.COM right HERE. 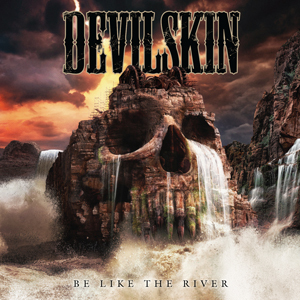 DEVILSKIN has established themselves as a household name in their native New Zealand. Formed in Hamilton in 2010, this four piece rock band are bonded by blood: Paul (bass) and Nic (drums) are father and son, Jennie (vocals) is Nics’ Aunt and Pauls’ sister in law, Nail (guitar) is Paul's evil twin. The band exploded onto the NZ rock scene with the infectious "Little Pills" and "Never See The Light" singles. Their debut album, We Rise, released on July 11, 2014 and went straight to the top of the charts, remaining as the #1 Album and #1 Kiwi Artist Album for 3 weeks, achieving Gold sales after only 2 weeks. 11.11.16 was the International release date for their second studio album Be Like The River, recorded in the UK village of Tetbury located in the Cotswolds. The songs are real, raw, and honest; Jennie's vocal delivery could be both the sweetest and the scariest voice you’ll ever hear. Deep with texture and steeped in emotion, each song has a life and a personality of its own. A journey through the highs and lows of our deepest desires and secrets, the songs reflect light and dark, whispers and roars, and have a recurrent theme of love tempered with pain. With a staunch work ethic from the very beginning, the band has toured relentlessly, garnering an impressive fan base and unprecedented support with radio play, live shows, and extraordinary album sales. The band's attention to detail with their live show gained them tremendous credibility; while other bands were cutting down on production costs to save money, DEVILSKIN was putting everything into the stage, sound, and lighting to make each show spectacular. The band has toured Australia three times, played showcases in London and Los Angeles (2015), and toured the UK & Europe (2016). They have also shared the stage with MOTLEY CRUE, ALICE COOPER, SLASH, ROB ZOMBIE, FIVE FINGER DEATH PUNCH, MEGADETH, KORN, and COHEED & CAMBRIA. DEVILSKIN headlined the rock stage at Homegrown Festival Wellington in January 2016.